Since the onset of the Playing for Peace/ PeacePlayers International programmes, the sight of American basketball players in the teams of Northern Ireland has become commonplace. Older Belfast basketball fans may recall the days before PFP/PPI when the only US ‘ballers you saw were the imports plying their trade in the superleague. The names of Pat Campolieta, John Leahy, and Javann Dupree as well as those of more recent players like JoJo Chambers, Jermaine Washington, Kevin Ratzsch, Phil Valenti and RaMell Ross will be remembered with varying degrees of affection during their respective tenures at Belfast Star. During the middle years of the last decade, the American players brought to Belfast were partnered on court with a “Bosman” signing; ie a player who held a European passport. Star were unusual in this respect as throughout these years, they already had their own “Bosman” in the shape of lightning-fast English-born guard Scott Summersgill, still playing at the highest level of Irish basketball at the age of (whisper it) 40, in 2012. Thanks to the often bizarre rules laid down by Basketball Ireland, Summersgill, despite living in Belfast for over a decade with his wife and children, has yet to be naturalized in basketball terms, always counting towards Star’s quotient of foreigners. When Basketball Ireland brought in the “at least two Irish players on court” rule, the “Bosman” signing became superfluous for Star. This meant that the last Star “Bosman” was the affable New Zealander, Dave Langrell. So it was that he moved to the rebel county. Alongside Americans Kenny Gamble and Charron Watson, Langrell helped Neptune to the 2002-2003 superleague title, their eleventh triumph. What was it that made Neptune so successful at this time? After a second season in Cork, Langrell was lured north of the border by the prospect of playing for Darren O’Neill’s first Star team, O’Neill having succeeded Danny Fulton at the end of the previous season. Irish basketball had, of course, not seen the last of one of its most prominent figures as Fulton would continue his involvement with the club, returning as head coach when O’Neill stepped down four years later. Also departing were iconic point guard Adrian Fulton – for Langrell and indeed many others since, “The guy I wished I’d played with…a genuine pure point guard who made everyone else better” – and veteran shooting guard Gareth Maguire, with Maguire now heavily involved in the nascent University of Ulster basketball project. Langrell linked up with club stalwart Summersgill along with imports Pat O’Malley and Reggie Winkfield. Sadly the season was disrupted by an early injury to O’Malley which brough in Josh Nigut as a short term replacement. All three ultimately ended up leaving the club, replaced by the sharp-shooting Nate Connolly and seven-footer Jamie Hughes, a PeacePlayers import based in Dungannon. So what happened this season? Langrell returned to Belfast for season 2006/2007 to take up employment at Lough Shore Comprehensive school. The new “two Irish players” rule, the first in a series of often misguided attempts to improve the standard of domestic basketball on the part of the ruling body, brought about the rather bizarre situation where Langrell, arguably the most talented player in the city at the time, was (aside from a two-game tenure filling in at Dublin’s Killester) reduced to playing games of one-on-one with Mike Calo, which he claims to have dominated, although Calo’s recollections are massively at odds with this account. Dave left Ireland for good in the summer of 2007, returning to Christchurch with his wife Justine. 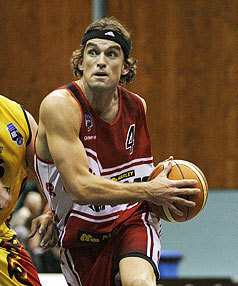 He played two more seasons in the NZBL, for the Canterbury Rams and the Hawkes Bay Hawks before completing his playing days. Now with a young family, he runs a social basketball league in Christchurch in addition to his parenting and substitute teaching duties. In late 2011, he completed his first half-marathon, coming first in the “head band wearing, shaved legs, over 6’4″ and 100kg with a bung knee” category. Can we ever get a post up without mentioning that Calo guy!! Great read Andy, remember travelling to St Malachys getting ready to hammer star in prem league only to have Dave dominate the game without hardly taking a shot! Mike Calo is the sun around which NI hoops revolves! A super player but even better bloke! Wish him all the best for the future! !